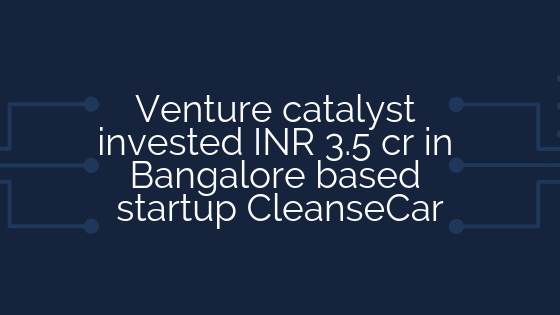 Venture catalyst invested INR 3.5 cr in Bangalore based startup CleanseCar. CleanseCar is an app-based daily cleaning service for cars and bikes funded by Venture Catalysts and other investors Omphalos Venture India LLP, Rishabh Mahimtura, Anil Patel and Vishal Brambhatt of rupees INR 3.5 Cr. The startup provides door to door service to the customers. The startup is based out in Bangalore, started by Kalyandhar Vinukoda and Pratibha Shalini in the year 2017. It provides you the simplest most economical car wash solution application to serve at the doorstep for bike and car. It provides you with the best service to clients. Both founders previously worked as software professionals. In the country, the car and bike washing are working in an unorganized matter. The value of the unorganized industry is around $ 3 million in the country. The startup is trying to make the industry in an organizing manner. The venture catalyst and others invested in this startup because of the potential in this business. This startup is offering its services in Bangalore and Chennai and planning to extend its services to major cities of the country. In the initial stage, it served 200 cars after the first round of funding the startup reached to 2000 cars, now it is going for 20000 cars to serve. India biggest tech community by GirlScript redefining tech education for tier-2 &3 cities.